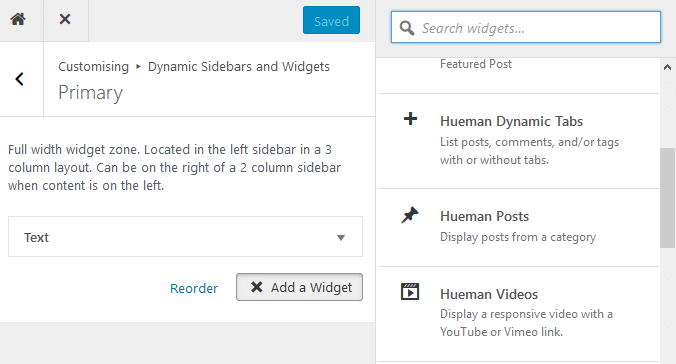 (*) if you are not sure to know what are the WordPress widgets, you can quicy check this documentation page. Where can you find the widgets settings ? You can add one or more of these widgets in the widget areas through the customizer panel. 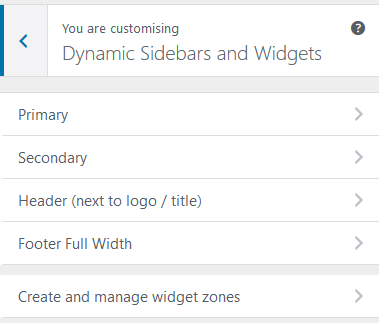 In the customizer panel, go to Dynamic sidebars and widgets, and choose a widget zone - Primary, Secondary, Header or Footer. Now, click on Add a Widget button. Among other widgets, you will find these three widgets too. You can choose one among them and start customising as per your needs. 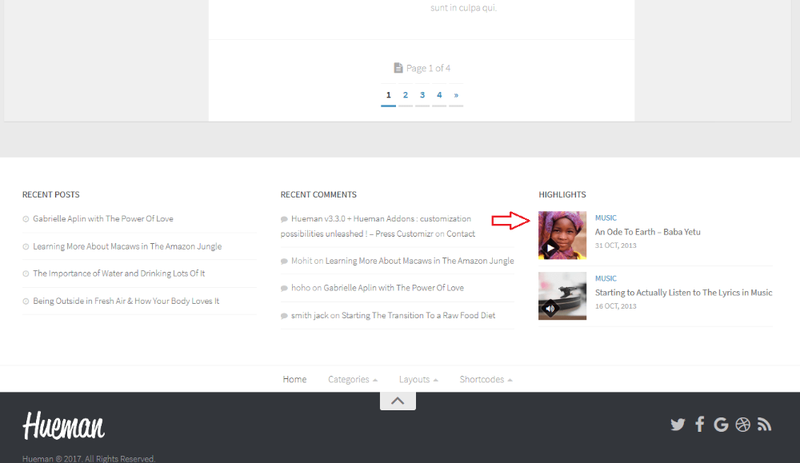 Hueman Posts widget is used to display posts from a particular category. First fill in the title. You can choose whether to show the thumbnails or not, by checking Show thumbnails. You can decide on the number of Items to show. Choose a category from the drop-down box that shows the available categories. You can order these posts by Most recent, Most commented or Random. 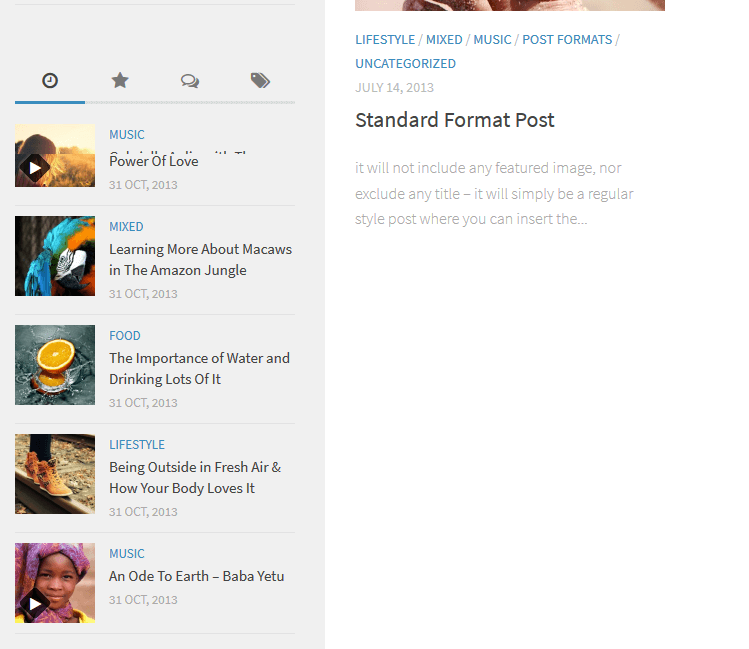 You can also choose to display posts published in a particular time period. All time is the default. You can change it to This year, This month, This week or 24 hours. 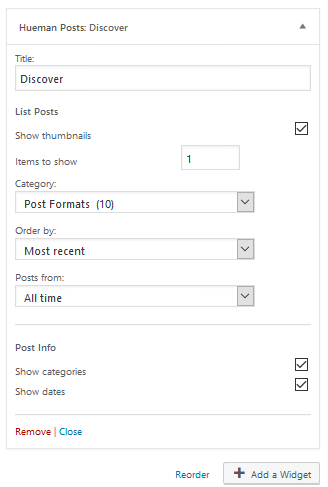 There are two more options - whether to show the categories and the dates for each post in the list. 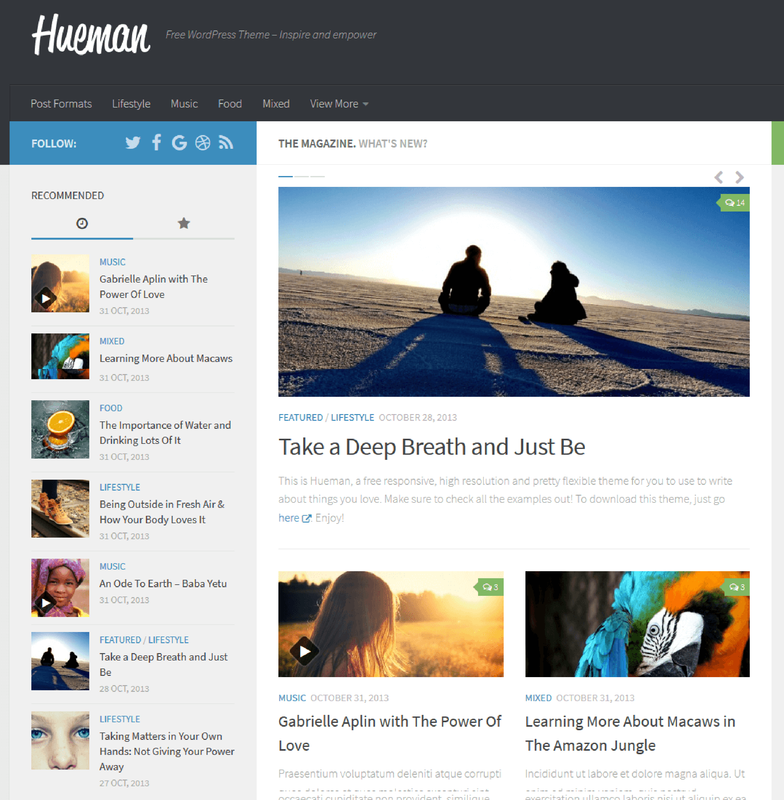 Here is a sample Hueman Posts widget configuration. Here is the corresponding display on the site. A second example configuration is shown below. The widgets displays as below. Hueman Dynamic Tabs widget is used to display a tabbed widget showing multiple lists. You can fill in an optional title. There are 4 possible lists and hence 4 possible tabs. If you check against Enable recent posts, this tab will be enabled. 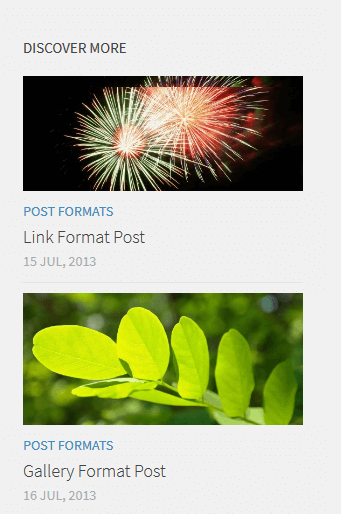 You can check against Show thumbnails to display the thumbnail of the featured image. Decide on the number of Items to show and the Category. 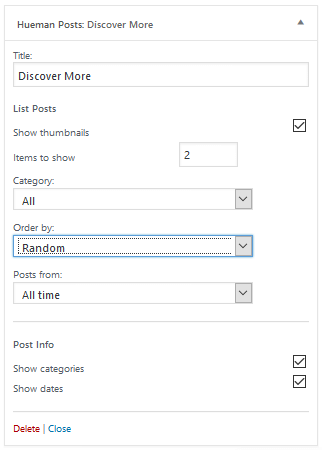 In the Most Popular section, if you check against Enable most popular posts, this tab will be enabled. This is similar to the first tab in the options available. The only additional option in this tab is to choose posts from a particular time period. All time is the default. You can change it to This year, This month, This week or 24 hours. In the Recent Comments section, the first option is to enable it. You can decide to display the avatars of the commentors by checking against Show avatars. Choose the number of Items to show and you are done. The last tab option is Tags and you can choose to enable it or disable it. The penultimate section decides the order in which these lists are tabbed. By changing the default order, you can change the tab order during display. The last section lets you choose whether to show categories and dates along with each items in the lists. For the above sample configuration with the first two tabs enabled, the display looks as below. Here is another example configuration with just a single list. The tabs are not really used. Here is a third configuration showing all tabs. 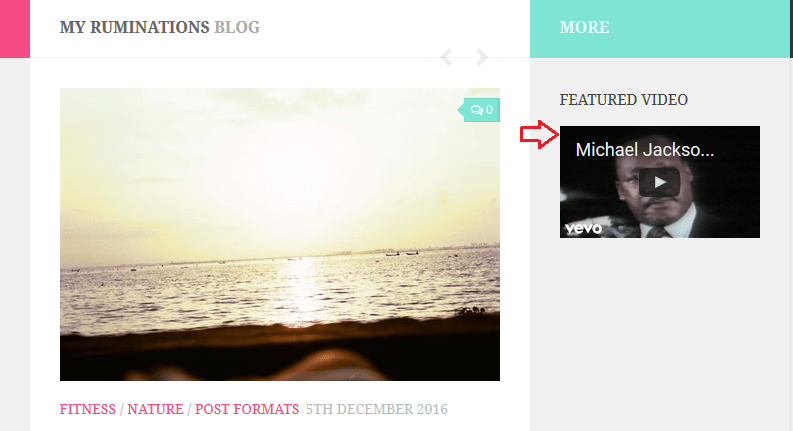 The Hueman Videos widget is used to display a video in any of the widget zones. It is simple to use. 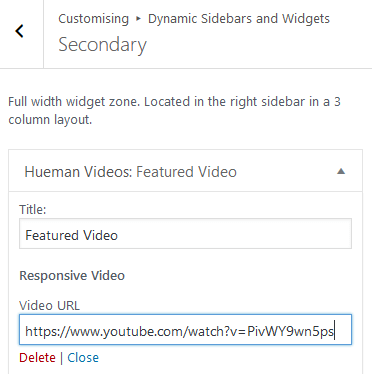 Just input an optional title and the url of the video you want to display. Here is the widget configuration. This looks like below on the website. These are the three simple, but utilitarian widgets that comes packed with the Hueman theme. Use this to add value to your website/blog.